In this madcap comedy, Geena Davis plays Valerie, a manicurist living in the valley with her cold fiancé, Dr. Ted Gallagher (Charles Rocket). At the Curl Up and Dye beauty salon where she works, Valerie enlists the help of her boss, Candy Pink (Julie Brown), for some style advice to try and win back Ted's affections. After undergoing a brand-new hairstyle, Valerie learns that Ted is having an affair and she kicks him out of the house. Soon, while lounging around in her bikini, a spaceship from the planet Jhazzalan crash-lands in her swimming pool. 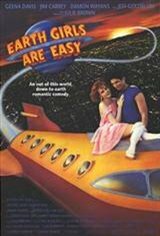 Curious, Valerie befriends the ship's inhabitants -- three horny aliens covered in fur named Mac (Jeff Goldblum), Whiploc (Jim Carrey), and Zeebo (Damon Wayans). Introducing her new friends to Candy, the aliens get a shave and a total makeover transformation into hot, available dates. They all go out dancing at L.A. nightclubs and party.